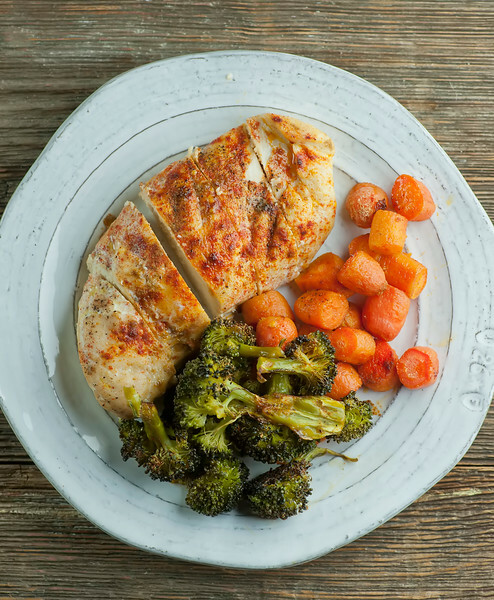 This recipe for one pan roasted chicken and vegetables comes with the extra advantage of super easy kitchen clean-up! My favorite part of this recipe for one pan roasted chicken and vegetables is the fact that it gives me a delectable, feels-like-Sunday-dinner combination of tender roasted chicken and scrumptious veggies in practically no time. My second favorite part is that this scrumptious combo of eats roasts up all on one pan. One pan that is lined with foil. YES, this means that after you have served it up, the clean-up consists of crumpling up that foil that it baked on and putting the pan away. No scrubbing, no soaking…as long as you can find someone else to put the dinner plates in the dishwasher, you are pretty much golden. Yep, one pan roasted chicken and vegetables means that you not only get a good and good for you supper, you can also use all that extra time for doing something that is not cleaning up the kitchen. Which brings me to my latest obsession. 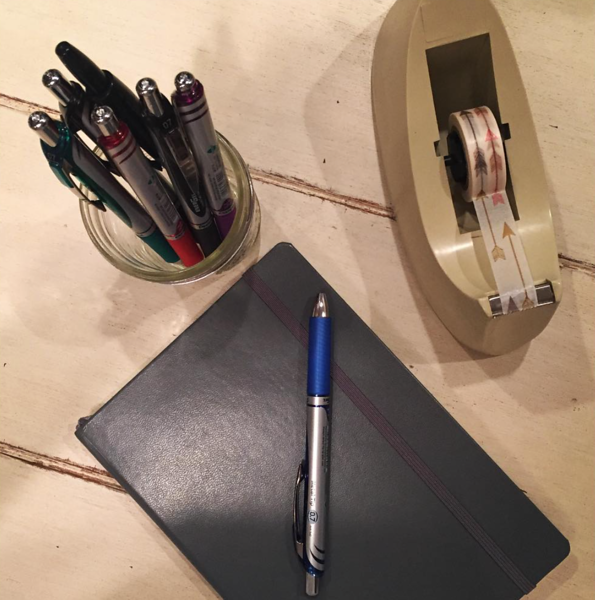 Once you are up and running with your bullet journal it is very easy to keep it in good working order, but at the beginning you will get slightly obsessed by finding the perfect notebook. And pens. And washi tape. In all seriousness, this old-school pen and paper system has made this digital-loving girl even more organized over the three billion things that I have to do each day, and between that and making one pan roasted chicken and vegetables for dinner, I actually have time to watch all those episodes of Wolf Hall that I taped and never got around to. So here’s the drill on the chicken: you need boneless chicken breasts – the regular kind, not the thin kind. You are going to pop them on a rimmed baking sheet that has been lined with foil and drizzled with some olive oil. Surround them with some chopped carrots and broccoli florets (or any other roast-able veggie. Asparagus, potato chunks, cauliflower…whatever your favorite is!). Here’s a little video that shows you just how fast and easy this all is…. And after you finish eating that deliciousness, you’ll have a clean kitchen where you can sit around and write in your bullet journal. Or whatever else you want to do with all that non-cleaning-up-the-kitchen free time! Drizzle the pan with 1/2 of the olive oil. Place the chicken in a single layer in the center. Put the broccoli on one side of the chicken and the carrots on the other. Drizzle the remaining olive oil over the chicken and the veggies. Mix the spices together and generously season first the chicken and then the veggies. Roast for 30 minutes, or until the chicken registers 165 degrees. Serve at once! Rejoice afterwards at the lack of pots and pans to clean. This looks really tasty! 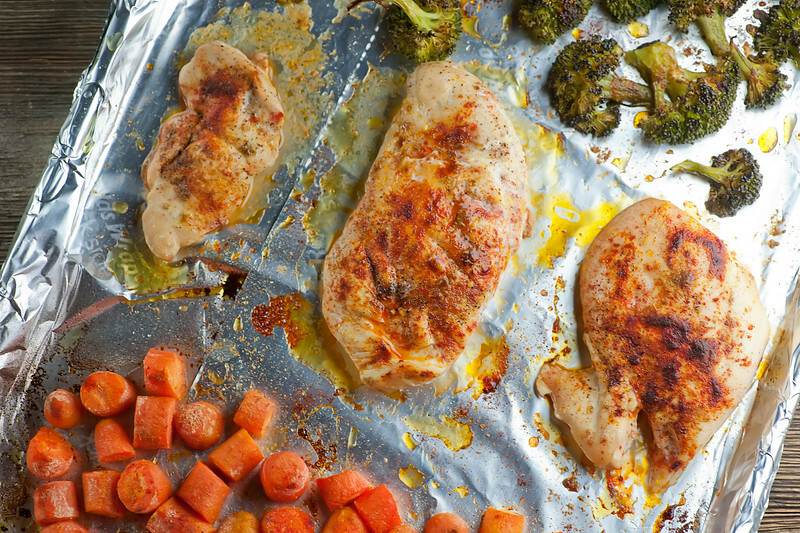 I have been using foil to line my pans for a long time and you are right, such a clean-up time saver! Especially for roast-y things from the oven that tend to stick and burn. Definitely will be making this soon. I’m going to swap in some smoked paprika for the regular because I love the taste it adds. Thanks for another good one, Kate! And the nonstick foil is even MORE wonderful! Love the smoked paprika idea. I actually want to make fish for lunch today, but now I keep finding all these great chicken breast recipes and would like nothing more than to eat chicken. It looks so perfect! One pan meals are the best! I especially like them because of the easy clean up. This roasted chicken sounds delicious, Kate! I think we can form the one pan Dinner Club together – hurray for delicious easy clean-up! As much as I love all things digital and computer and all that, I still do all my planning with pen and paper. I can’t help the feeling of calm and tangible resolution that writing something down gives me. This is just exactly the kind of dinner I want all winter long! Thanks Joan! Healthy and easy and good! i love sheet pan suppers! easy clean-up and easy prep! definitely need to look into this bullet journal thing. You MUST! It’s so satisfying. I love this because it’s so versatile. I usually cube a few sweet potatoes as the vegetable component but keep pretty much everything else the same, then I have delicious dinners for days. Simple, works every time, only takes about an hour in all, and makes the rest of my week a lot easier. I was curious as to how this recipe would work for frozen food. Would I simply adjust the cook time, or would I need to thaw the ingredients prior. I ask because I’m in college, and I buy my veggies and meat in bulk and freeze them to save money. This looks like an awesome recipe that I’ll likely be using for many years to come. They are thawed, and yes I will! Hi Ethan! About 350 calories a serving. Just made this tonight and everyone loved it! All clean plates! I used the carrots but didn’t have broccoli so we used asparagus and also sweet potato and onion. Didn’t have oregano so used Italian seasoning. Everything turned out perfect, thank you so much for sharing! I can’t wait to try out your other recipes!!! Just moved into our new place so I was looking for something easy and delicious to cook for a late dinner! Stumbled upon this recipe, and I’m so glad I did! Super simple, and really tasty!!!! Thank you! This was great! While I had the vegetable cutting board out, I added a quartered onion and a few peeled garlic cloves which gave a great aroma while cooking, and then we ate the onions with the meal. i crushed one of the cloves and added it to my plate. No other takers for the garlic. Can it be made with frozen chicken? I didn’t plan this but I’ve started it and I forgot to thaw the chicken. Can I do this with zucchini and squash? Just cut it up and put on pan? Hello! I’m just trying this recipe and was curious on the temperature because it says when the chicken reaches 165 degrees. On my thermometer it gives the cooking temperatures and says for chicken to cook to 180 degrees. I know we just had our thanksgiving turkey and cooked it to 160 degrees. Looks delicious! Where is the video? Cant find it. Hi Lourdes! That is the strangest thing – that video seems to have escaped! I just put it back in, so hopefully if you take another look it will be there. Mysterious!